Did you know that January 19th (today) is National Popcorn day? Me neither, until two days ago. I’m always behind on these things. To celebrate, I decided to get creative and make up a batch of this Chili and Lime Popcorn in Coconut Oil. It’s worth mentioning that when I originally brought this recipe to the blog, I was sippin’ the health world’s Kool-Aid; I was under the belief that coconut oil was a prime option with a plethora of health benefits. But after digging deeper, I did find some information that made me raise a brow and reconsider. Harvard Medical School has an article that was published in 2011 (and updated in 2018) that states that coconut oil is approximately 90% saturated fat—which is higher than butters 64% and lards 40%. (Whut.) Saturated fat, in excess, raises bad LDL cholesterol levels which increases the risk of heart disease thus going against everything I stand for here at KT. Don’t get me wrong, I believe in treating yourself, but if you’re going to treat yourself, you might as well use butter over coconut oil in this case. Despite he fact that coconut oil does give good HDL cholesterol a boost, it’s advised to use it sparingly and, of course, don’t treat it like a healthier option. Chili and Lime Popcorn in Coconut Oil. Popcorn in general seems to be viewed as a healthier snack option, but I’ve been known to sabotage that. I’m a huge sucker for super garlic-y butter-y popcorn with salt. The hubs and I make it once in a while for the odd movie date night where he’s confident he won’t fall asleep halfway through, and we quench our thirst with colas like a couple of jerks with awful eating habits. But hey—most days are pretty well-balanced around here. 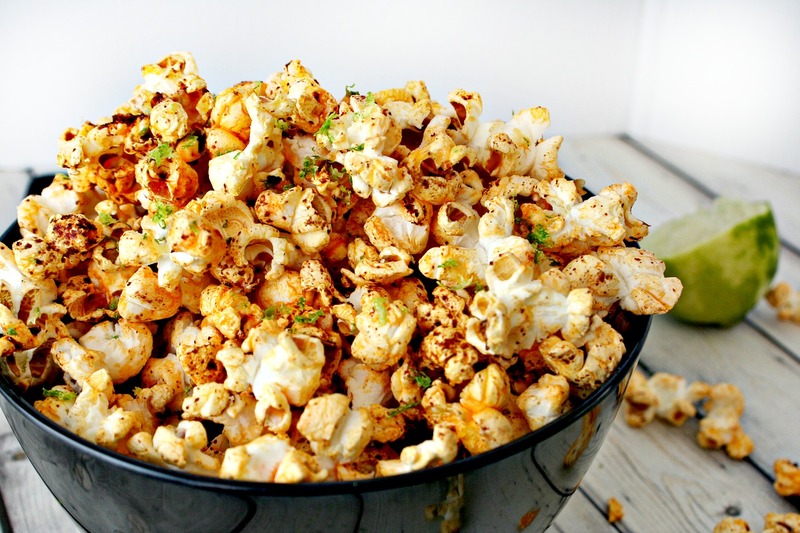 This Chili and Lime Popcorn in Coconut Oil is a healthier another option, and it is SO. TASTY. It’s light, refreshing, and even better: it’s popped in and drizzled with coconut oil. Nomtastic. If you want to skip the coconut oil, you can try it with butter, or go healthy with avocado oil. Pop the popcorn as per the directions on the packaging. Use 2 tablespoons of coconut oil. In a small saucepan, heat 2 tablespoons of coconut oil on medium-low. Add the chili powder, and stir well to combine. Add the juice of one lime leaving just a bit of juice in the lime to spritz the popcorn when served. Bring to a low simmer, remove from heat, and stir. When the popcorn is ready, drizzle the coconut oil over the popcorn. Finish the popcorn off with a spritz of lime juice and sprinkle with lime zest. When do you do something with the other 2 tablespoons of coconut oil? I could have definitely worded that better — sorry for the confusion! Thanks, Jared! Being the huge buttery popcorn fan that I am, I was surprised and delighted at how much I actually enjoyed this, haha.